Watch a fun video clip about other words for "big"
Find words that mean the same as "good"
Watch a video about other words for "small"
Can you find pairs of words with opposite meanings? For more word games, scroll through the menu on the left. Click on a topic then point your mouse at a picture to hear and see the word. Click on "World" or "Collections" and choose a topic. Click on sound icons to hear how to say the words. 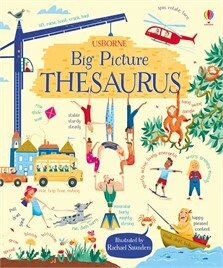 Story-writing time is going to get better, easier and more fun with this fantastic new picture thesaurus from Usborne.... Pages of eye-catching illustrations help to develop thought processes and there are simple word games to expand on knowledge gained from using the thesaurus and links to useful and complementary websites. The wonderful world of words in one big, beautiful book.